Multi-LiteTM is a corrosion-resistant light fixture and is available with (part number: 458-S) or without (part number: 458) an ON/OFF switch. Multi-LiteTM can be used with 12V, 24V or 32V DC electrical systems as well as 110V and 220V AC electrical systems. Wiring and bulb are not included and should be matched with your electrical system. Use standard, medium base screw-in bulbs. Bulbs in the 15W-25W range are recommended. DO NOT use bulbs which exceed the fixture’s 40W maximum rating. The Multi-LiteTM can be installed horizontally or vertically on any flat surface. The Multi-LiteTM base is made of polycarbonate plastic and is not flexible, therefore use care when installing the fixture and do not over-tighten the mounting screws. Consider using rubber grommets under the mounting feet for added support and vibration resistance. The Multi-LiteTM is designed for use in engine rooms, storage compartments and other enclosed spaces. 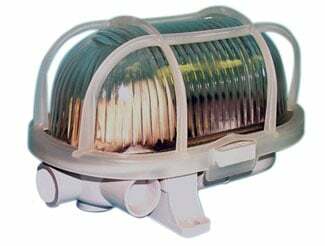 If you choose to install the Multi-LiteTM outside the cabin or as a dock light, avoid mounting the fixture in direct sunlight as UV radiation can cause the protective cage to become brittle and easily damaged.